Jitterbug cell phones represent a popular brand in the senior phone market. The Jitterbug phones offered by GreatCall, which is intended to help senior users by providing cell phones with an easy to see and use interface. GreatCall also offers the Jitterbug cell phone plans, which are designed with seniors in mind and offers all the senior lifestyles need from talk to safety and health care services. Below you will find a preview for the Jitterbug Flip, focusing on the phone features, safety options, and price. The Jitterbug Flip is built to be an easy-to-use cell phone that helps seniors to easily make and receive calls. 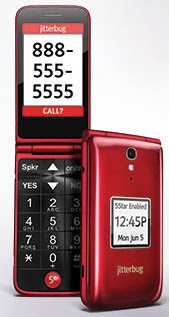 It has well-spaced large buttons with big, easy to read numbers, and the voice dialing feature, which allows the user to tell the phone who to call. The Jitterbug Flip is designed with seniors in mind so; it comes with a clear screen that displays big font numbers and characters, loud and clear speaker, easy menu navigation by the YES or NO buttons. In addition, this Jitterbug phone can save you in emergency situations, you can easily call for help by pressing the (0) button at any time. Backlit keypad with large buttons. Clear, colored screen display with big characters. 5Star button for the emergency. GreatCall offers health and safety services. You can see more information about the healthcare packages in the Jitterbug plans section. Recommende: Jitterbug vs Consumer Cellular comparison. The Jitterbug Flip cell phone is offered by GreatCall for $100 and one-time activation fee of $35 along with any monthly plan from GreatCall which is the service provider for the Jitterbug cell phones.